Most of the estimated 18 million Americans who have sleep apnea don’t know it. If it’s left untreated, the disorder can increase the risk of life-threatening conditions such as heart disease, diabetes, high blood pressure, and stroke. It can also cause daytime sleepiness and increase the risk of accidents wherever you are—at home, work, school, or behind the steering wheel of a car. If you think that you or someone you love is suffering from this condition, Dr. Thein can help. “Apnea” is Greek for “without breath.” People who are affected by it stop breathing involuntarily and repeatedly for brief periods while they are asleep. As shown in the diagrams on the right, obstructive sleep apnea occurs when the muscles in the back of your throat relax and narrow or block your airway. Your tongue falls back against your soft palate, the soft palate falls against the back of your throat, and your airway narrows. When you inhale, the air does not enter your lungs, and you can briefly stop breathing. To solve this, Dr. Thein can make an oral appliance that moves your lower jaw forward and opens the airway, as is shown in the bottom diagram. Chronic snoring is the most common and recognizable symptom. Narrow, floppy throat muscles cause vibration that makes the snoring sound. The narrower your airway becomes, the louder you will snore. And you may begin to choke or gasp for air while you sleep. Although a sleep study is the only way to completely diagnose your symptoms, you can get a pretty good idea from our signs and symptoms page. To find out for sure, Dr. Thein will start by reviewing your symptoms. If a sleep study is warranted, he will arrange to have that done in the convenience of your home. For the sleep study, Dr. Thein will order an at-home sleep monitor for you. Complete Sleep Inc. will send you an Apnea Risk Evaluation System™ (ARES) at-home sleep monitor, along with a questionnaire that is based upon published findings of the American Academy of Sleep Medicine. Your medical insurance company will be billed for the sleep study. If your insurance plan does not provide benefits for the sleep study, the maximum amount that you are responsible for is $295. The sleep monitor is worn on your forehead. It is lightweight, comfortable, and easy to use. Along with the sleep monitor, you will receive instructions on how to use it. When your at-home sleep study is complete, you will send the questionnaire and the ARES monitor back to Complete Sleep Inc. in the packaging provided. Your diagnosis will be made by a medical doctor who is a diplomate of sleep medicine. The American Academy of Sleep Medicine endorses the use of oral appliance therapy for mild to moderate cases of sleep apnea. Dr. Thein successfully treats these cases with the Sleep Herbst® oral appliance. If you are diagnosed with a mild or moderate case of the disorder and want it treated, Dr. Thein will start with taking impressions of your teeth. These impressions will be used to make a customized appliance for you like the one pictured on the right. The appliance will fit over your teeth to hold your jaw in an optimal, but comfortable position that will keep your airway open while you sleep. Your medical insurance plan will be billed for the appliance. If your case is severe, you will be referred to a pulmonologist. 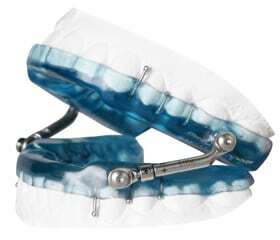 If you have difficulty wearing a CPAP breathing machine, you may sign a waiver to receive an oral appliance. Do You Think That You Have Sleep Apnea? If you think that you may have this condition and would like to be certain, call us to schedule an appointment, or request an appointment online.